Designation: Continuing Education, Inc. designates this live activity for a maximum of 10 AMA PRA Category 1 Credits™. Each physician should claim only the credit commensurate with the extent of their participation in the activity. This activity is approved for a total of 10 contact hours of Continuing Pharmacy Education (CPE) credit. Civitavecchia (Rome), Italy - Plan your time here carefully, as the Eternal City's sights are endless: the Colosseum, the Forum, the Sistine Chapel, the Vatican and so much more. Livorno (Florence/Pisa), Italy - In Florence view the timeless treasures: the lofty Duomo, Giotto's bell tower, Michelangelo's David, the Uffizi Gallery, Ponte Vecchio over the Arno. In Pisa, see the famous Tower, still standing, if crookedly, after 650 years. Ajaccio, Corsica, France - Corsica is an island of rocky outcroppings and sandy beaches, with secret trails that lead inland over fields and through lazy villages. In Ajaccio, visit Napoleon Bonaparte's house, birthplace of Corsica's famous son. Buy a wedge of tangy cheese at the market, and in the mountains, delight in the scent of sun-warmed thyme. Valencia, Spain - World-famous architect Santiago Calatrava has made his mark on Valencia with the impressive City of Arts and Sciences (Ciutat de les Arts i les Ciències). This beautiful complex consists of a cinema, garden, theater, planetarium, science museum and more! Monte Carlo, Monaco - The Casino, of course--if only to venture into the enchanting Salon Rose, with its nymphs on the ceiling. A drive along the scenic Corniche which takes you to Nice, undisputed capital of the Riviera. 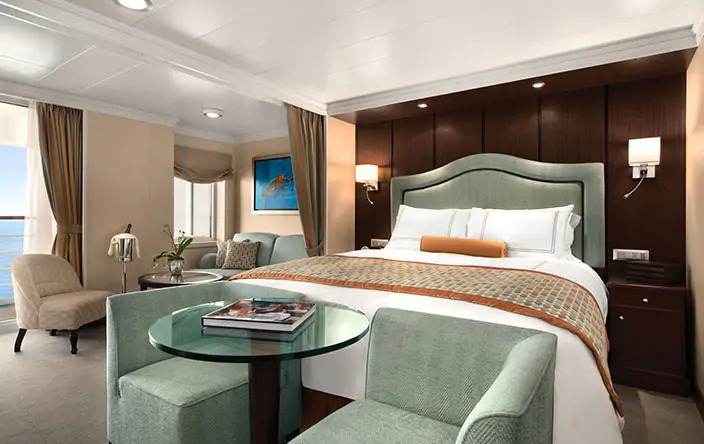 Located in the most desired of locations, our Concierge Level Veranda Staterooms offer an unrivaled combination of luxury, privilege and value. 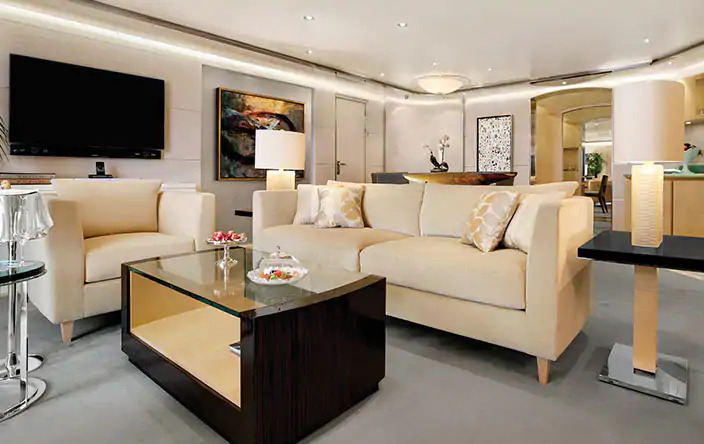 A wealth of amenities and a host of exclusive benefits elevate the experience to the sublime. 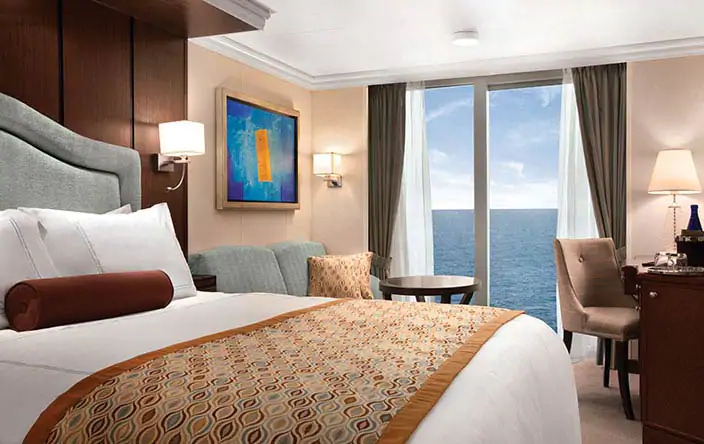 You will even have the services of a dedicated Concierge, the ultimate comfort of ordering room service from the extended Grand Dining Room menu during lunch and dinner, unlimited access to the private Spa Terrace at Canyon Ranch and even free laundry service. 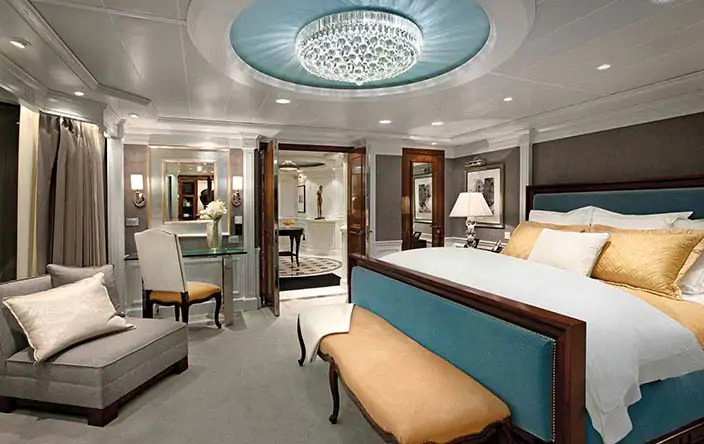 Featuring a comfortably furnished private veranda, our most requested luxury, each stateroom also includes a plush seating area, refrigerated mini-bar, spacious closet and a marble and granite-clad bathroom with a bathtub/shower and separate shower. 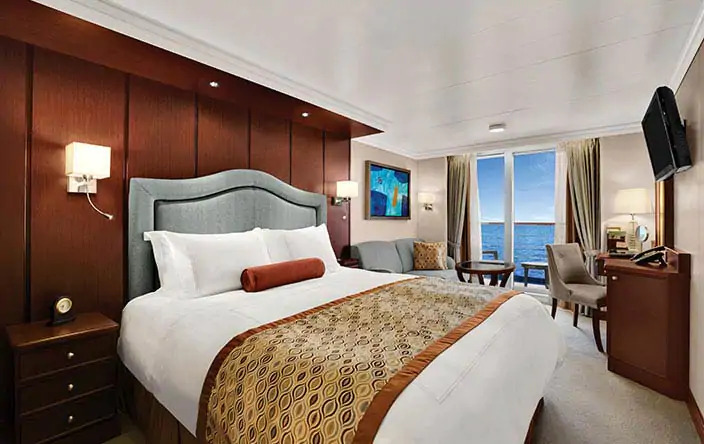 Prices are Per Person, based on double occupancy and include port charges, taxes , fees and a $900 air allowance. Prices are subject to change. 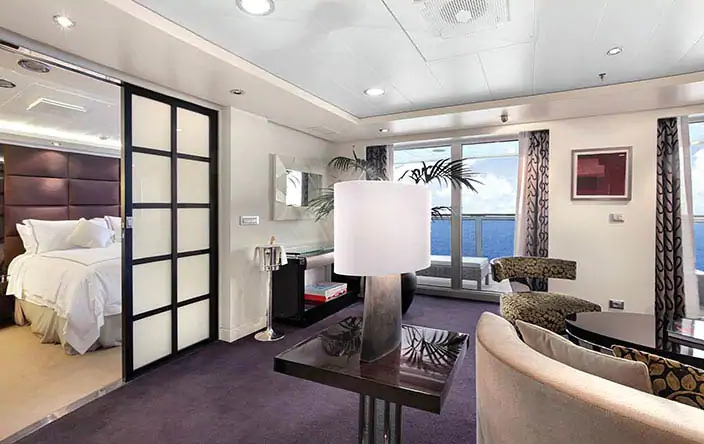 Important Note: Not all staterooms within each category have the same furniture configuration and/or facilities. 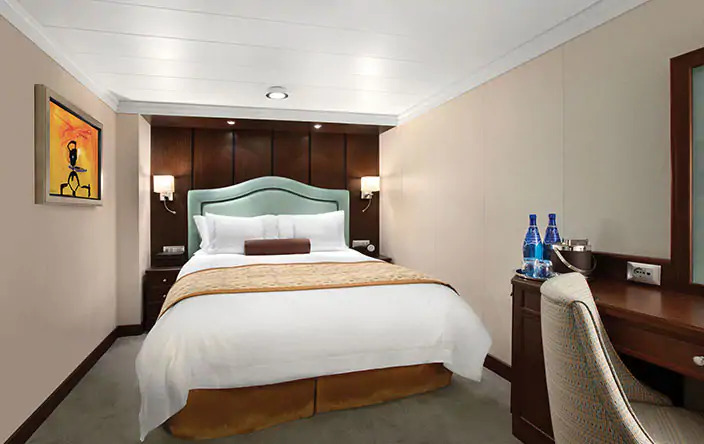 Appropriate symbols within the rooms on the deck plans describe differences from the stateroom descriptions . All information is subject to change. 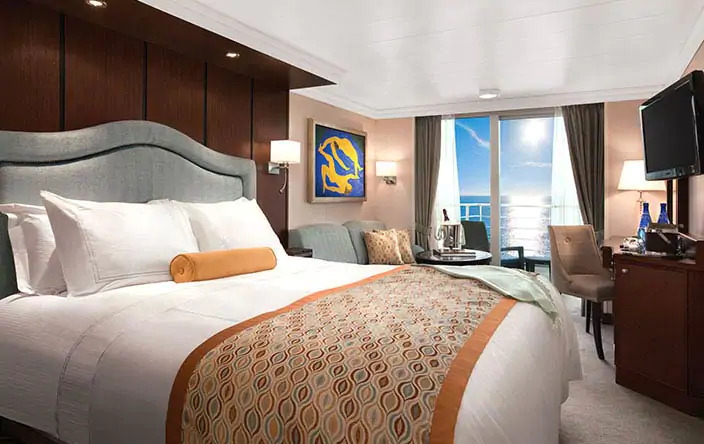 Cancellation Policies vary by cruise line, destination and sailing date. 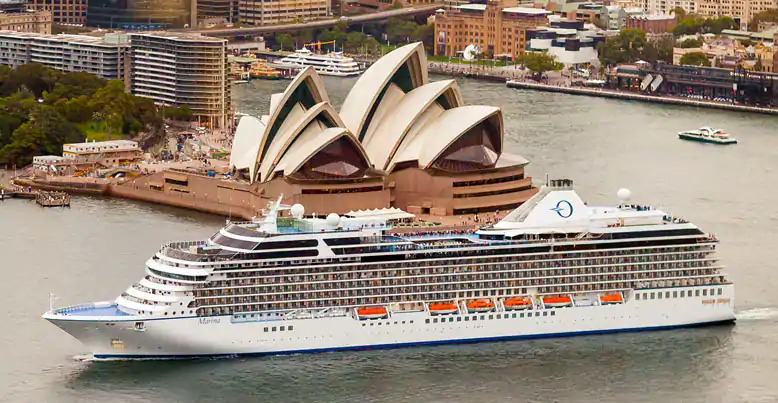 Please check with one of our cruise consultant for policies applicable to this cruise.